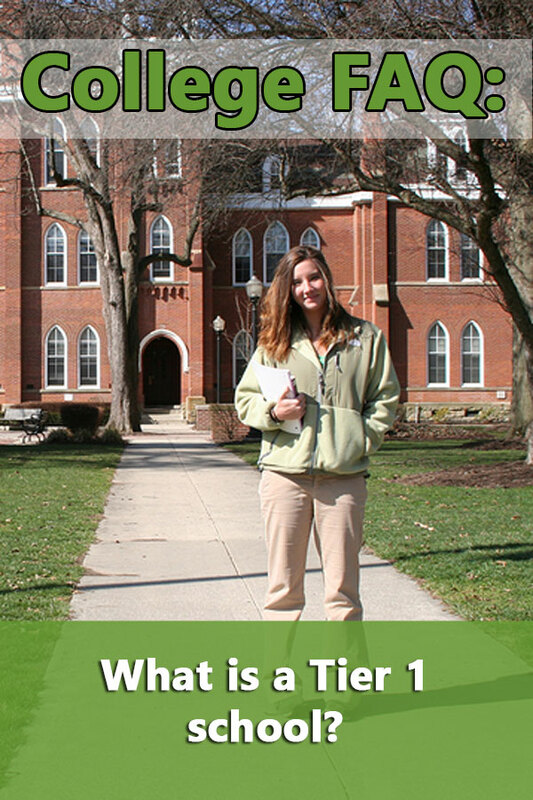 What is a tier 1 university turns out to be a very interesting question. I never really looked into it and just assumed that Tier 1 was a school ranked in the top 50 of US News College Rankings for National Universities. Tiers 2, 3, and 4 were the next group of 50 institutions. Anything not ranked in the top 200 were considered unranked schools. I do remember at one point something about US News deciding not to do Tier 2, that those schools would be part of a larger Tier 1, or something like that. The reason why I’m actually using fuzzy impressions is because there really isn’t any official definition of Tier 1. I think that it is often used by those in the college search process to refer to the top 50 schools ranked by US News and therefore, the most desirable or prestigious to attend. However, if you go by US News’ definition, all ranked schools in a category are now considered Tier 1 schools. That’s approximately 200 universities in the National University category. 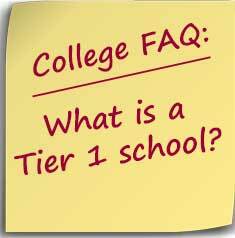 All unranked schools are considered Tier 2. Third, the colleges are ranked based on their overall scores. U.S. News publishes the numerical rank of the top three-fourths of schools in each category; the remaining lowest-ranked schools in each category are placed into a second tier based on their overall score. Schools in the second tier are labeled Rank Not Published and listed alphabetically. Wasn’t that nice of them? Now the top 75% of schools in any category can be called Tier 1 schools. The meaning is furthered muddied when you considered the Texas initiative to increase the number of Tier 1 universities in the state. According to the Texas Legislature, Texas has three Tier 1 universities in the state while California has nine. But it might also include the 60 United States schools that are members of the American Association of Universities which includes five institutions that didn’t quite make it into the top 100 of US News National University rankings. there are three organizations that are generally accepted as national arbiters of an institution’s rank as a Tier One institution. They are the Association of American Universities, the Carnegie Foundation for the Advancement of Teaching and the Center for Measuring University Performance, which issues Top American Research University (TARU) reports. Recognition by any of these three is taken as an indication of Tier One status. The Carnegie Foundation definition would increase the number of Tier 1 schools to 105, including the University of Houston. The Top American Research Universities lists 73 institutions that have at least one measure in the top 50. The measures include data on research, support, faculty awards, graduate training, and undergraduate test scores. Since there doesn’t appear to be an official Tier 1 definition, it seems to me that it’s a matter of perception. And it’s up to you to decide if the perception is based on your values and needs or of someone else’s.